Back in the mid-1980s, Joe Rodriguez Jr. asked his father for an acre of the family farm. He’d been applying pesticides to crops on the family’s 80 acres and it had made him feel sick. His idea was to try something different. Joe Jr. wanted to farm without chemicals. Joe Sr. was skeptical, but he acceded to his son’s wish. That one acre grew so successfully, that soon the entire farm, which is located in North San Diego County, was transformed. By 1986, only a year after organic farming certification became an official practice, the Rodriguez family farm was certified. Thus was born J.R. Organics. 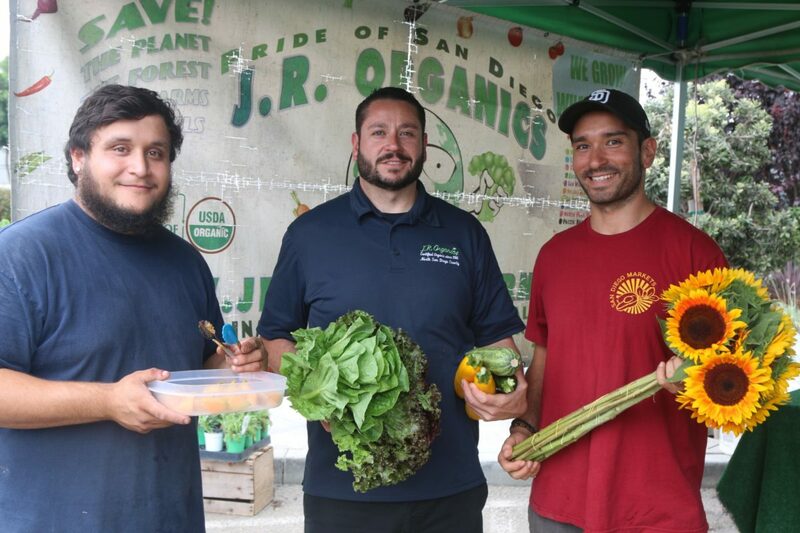 J.R. Organics’ produce is so strikingly different it’s attracted an almost a cult-like following at the Manhattan Beach Farmer’s Market. The market opens at noon every Tuesday, and if you want to buy Rodriguez farm spinach when it’s in season, you need to be there before 1 p.m. The spinach isn’t a particularly unusual variety — it’s called Bloomsdale Long Standing Spinach — but it’s thicker and almost shockingly more flavorful than most, if not all, other spinach. The story of that spinach is indicative of the story of J.R. Organics. The family has had five generations to experiment with varieties, and since going organic they’ve also perfected their growing techniques. Most spinach is machine harvested; this spinach is hand-harvested. “Nobody does that for spinach,” said Mike Clark. The 80-acre farm is big enough to produce a lot but small enough to carefully manage. The farm is hilly and thus has several different microclimates, which the family has learned over time to best match with the nearly 80 different crops it grows annually. They rotate crops regularly, keeping the soil alive and nutrient-rich, and also utilize a greenhouse. They buy water, not relying on groundwater sources, which can be polluted by other farms. And while all the extra labor involved also means the cost of their produce tends to run a little higher, those who try it once tend to return week after week. Mike always has simply prepared samples — often, heirloom tomatoes with salt, pepper, perhaps a little lime and basil, or sliced onions with three kinds of peppers with a touch of lemon juice. Once you’ve taken a bite, the hook is set. The family, of which eight members still work on the farm, reaches 14 farmers markets in San Diego County and four in LA County. Among their regular offerings are otherworldly strawberries, lettuces, several varieties of hardy greens, flowers, shoshito, bell, jalapenos, and serrano peppers, squashes, melons (try the unusual yellow-fleshed watermelon, a sure-fire summer hit), and those aforementioned tomatoes (which, like the spinach, tend to disappear quickly, so arrive early if you have tomato plans). The family also remains on the cutting edge of progressive farming, offering a Community Supported Agriculture program ($30 for a weekly box of produce) and occasional “agro-tourism” farm tours complete with five-course dinners. The Clark brothers’ mother, Irma Rodriguez-Clark, plays a big role in the farm’s ongoing transformation and organization. “She’s the real boss,” Mike said. And Joe Sr., now 82, still takes immense pride at what five generations of farming wisdom is able to bring to the market.